The Mt. 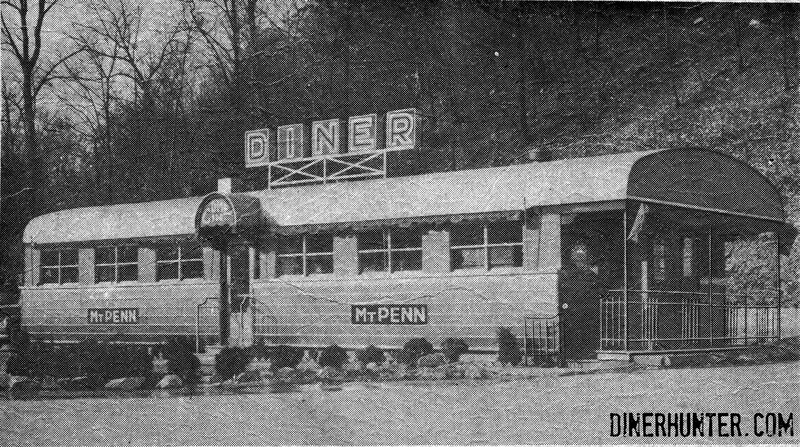 Penn Glass Front Diner was located at the east end of the Lindbergh Viaduct in Reading, PA. It looks like it was located roughly at 2101 Howard Blvd, where Arner’s Family Restaurant is now. (A real estate listing for that restaurant can be found here). The diner is certainly an unusual one. The extreme width (for the pre-war period) is reminiscent of diners built by General and by Bixler, however the roof curvature and detailing is wrong. More than likely it was built on-site by a local contractor. I will give them credit, though, this is a well executed job if that’s what it is. Do you know? That we employ 24 people in the diner, 24 hours. Do you know? That we average over 25,000 patrons monthly. Do you know? That this is America’s only Vitrolux Glass front diner and Pennsylvania’s Finest. We select all our employees, and instruct them to be civil, kind and thoughtful, even under the most trying circumstances. We think you have a right to know the quality of food we are serving. It may interest you to know: That we only use Idaho Potatoes – the world’s finest and that we served more than 60,000 pounds in 1940. That all our french fried and julienne potatoes are cooked to order in our modern electric fryers. That we use only the highest grade vegetable shortening for all our cooking and baking. That in 1940 we used more than 100,000 Berks County fresh eggs, supplied by a reliable farmer. All our eggs are fried in pure dairy butter. That we served 215,000 cups of coffee the same year. That we served 5,650 quarts of pure cream for coffee in 1940. That we served 15,500 quarts of milk during the year 1940. Do you know? That we grind our own hamburger fresh daily, from choice young beef rounds, and that we served more than 18 tons during 1940. That we use Swift’s special bacon and choice beef. That we use Heinz ketchup and tomato juice exclusively. That we use Spanish onions- the sweetest in America. That our success depends upon your satisfaction and your recommendation. . . If your food is not as you expect it to be, please oblige the management by having your waitress return same. We do appreciate your patronage. This entry was posted in Diners / roadside related, Diners/ restaurants and tagged 1930s, 1940s, Charles, diner, Lindbergh, menu, PA, Pennsylvania, reading, restaurant, Viaduct, WWII by Spencer Stewart. Bookmark the permalink.